In a recent blog post, we examined why investors should consider managed futures at a time when flows into passive funds continue to push equity valuations higher and volatility remains depressed. In that post, we explained that a growing sense of complacency among investors has led them to overlook mounting equity-risk exposures in their portfolios and that managed futures can be an effective way to proactively mitigate these risks. Now that we’ve established why investors should look into managed futures, it’s important to examine how they should go about participating in this low-correlation asset class. 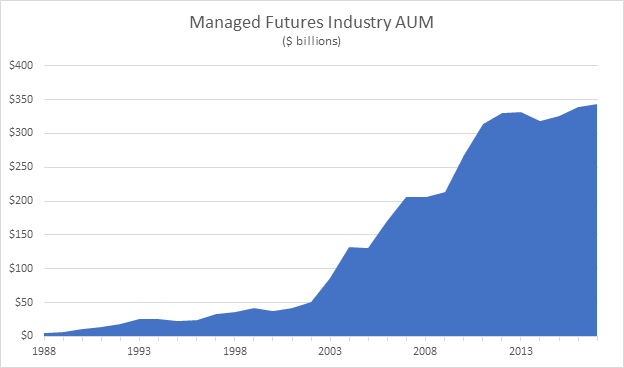 For many investors, their knowledge of managers who run managed futures funds (a.k.a., commodity trading advisors, or CTAs) is limited to the handful of large managers who have more than $10 billion under management. Why do investors only think of these mega-managers? Because, for many investors, these behemoth CTAs are the only managers that they have access to. Many bulge-bracket investment banks and wirehouses allow their clients to invest with external CTAs that have been approved for the bank’s or wirehouse’s platform of outside managers. From firm to firm, these platforms often are populated with the same group of a few large “brand names” in the CTA space. Risk-averse compliance departments often will only consider large CTAs for inclusion on the platform for several reasons. The most important of these is that compliance departments tend to operate under the assumption that size equals safety. They believe that a manager’s size gives some degree of protection from market volatility and that larger firms have more robust infrastructures and risk-control measures in place. But the history of the asset management industry is littered with tombstones of massive firms that didn’t use their immense resources to properly manage risk. Another reason why firms’ platforms tend to include the same CTAs is a desire for “safety in numbers”—or not wanting to go outside of the herd to find new managers. The whole point of investing in an alpha-driven strategy, such as managed futures, is to find managers who can outperform the market. We believe that small and midsized managers are better equipped to do this than mega-CTAs. Being nimble—that is, being able to quickly and aggressively pursue opportunities whenever and wherever they present themselves—is essential to success in managed futures. Because of their size, large funds often are precluded from investing in the most alpha-rich, least-efficient corners of the market. In some smaller, less-liquid markets, for a mega-manager to make a trade that is big enough to move the needle for the fund’s performance, the manager might accidentally “become the market” and not be able to get out of the trade profitably. Thus, mega-managers are limited to a narrower scope of potential investments. Smaller funds, conversely, are able to freely pursue opportunities while focusing only on alpha generation, not liquidity constraints. In addition to alpha, managed futures investors also are looking for exposure to low-correlation investments. Because of the aforementioned liquidity constraints, mega-managers often end up implementing strategies that mirror each other, thus creating unintended sources of correlation. Successful managed futures investing requires having access to the industry’s most talented managers—not just the most well-known and well-capitalized ones. Going beyond the beaten path to find elite, smaller managers is a daunting challenge for most investors. Our firm, aiSource, was created to help solve this problem. We are continually scanning the universe of CTAs to find managers who deliver attractive risk-adjusted returns on a relative basis. Rather than using size as a proxy for safety, a critical part of our due diligence involves rigorously examining a manager’s operations, compliance, and infrastructure to see whether they are well-positioned to deliver sustainable results for their investors.